A launch title for the Game Boy Advance, this remake of Super Mario Bros. 2 combines updated graphics and sound with all new gameplay elements, such as giant enemies and items, new boss battles and new stage clear challenges. Also included is Mario Bros. Classic, a multiplayer game based on the arcade Mario Bros. The game has a score. You receive bonus points for knocking out more than one enemy, and you can now earn 1UPs by knocking out multiple enemies simultaneously. You are no longer limited to two extra hearts per level. 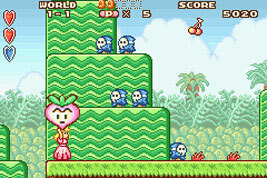 Some levels have multiple Mushrooms hidden in Sub-Con, giving you an even larger life bar. You can find larger versions of certain enemies that take longer to pick up than typical enemies. The boss of World 3 is no longer Mouser, but the all-new Robirdo. The small hearts that floated up from the ground after you defeated enemies in the original have been replaced with large hearts that can be found all over the game. Some are just floating in the air, some are buried as vegetables, you can earn them by defeating more than one enemy, and you also get them by throwing around large enemies or hitting enemies with a Shell. There are five Ace Coins hidden in each level. Collecting all of them in a stage rewards you with a 1UP. There is an additional challenge for finding every Ace Coin in the game. Some items are trapped in bubbles. Throw things at the bubble until it bursts. A rare random item ball can be found hidden away in certain areas of the game. You may occasionally find springy platforms, and certain Jars contain carousels instead of the usual platforms. Many stages have also received small tweaks in how they are laid out. Super Mario Advance includes short introductions to each of the boss battles. At the start of the World 5 boss battle against Clawgrip, he starts out as a Sidestepper, the crab enemy from Mario Bros.